In 2006 the government of Lagos state conducted its own census, finding that 17.5 million peopled lived within its borders, with a projected increase to 25 million by 2015, an annual growth rate of 4%. Speaking at the Economist conference in 2012, the governor, Babatunde Fashola, argued further that the state must plan for a “Lagos that can accommodate about 40 million people”1 within a few decades, certainly consistent with independent analyst Population Reference Bureau’s projections that Nigeria will grow from 174 million in 2013 to 440 million in 20502. With so many millions emerging within the Lagos metropolitan area soon, the most important challenge authorities face is how to accommodate them all in formal developments as quickly as they emerge, lest the bulk of them spill over into the informal sector in what would become one of the largest failures of housing creation the continent will have ever seen. The Lagos state government has responded to this challenge by drawing up “city model plans” for a number of areas which together imagine the transformation of almost the entire state into a sprawling garden city metropolis. Residential subdivisions will be organised within a super grid of highways and public transport corridors stretching along Lagos’ coast from the border with the Benin Republic in the west, to the Lekki Free Trade Zone in the east. In theory at least, these plans have found ways to accommodate somewhere around 30 million residents within the state by 2030. This response is complicated however by the threat of climate change. Most coastal cities are susceptible to inundation from rising sea levels, but Lagos is particularly vulnerable. In 2008 the OECD determined that 3.2 million Lagosians may become exposed to flooding from climate change as a result of rising sea levels, increased storm intensity and land subsidence, making it the 15th most vulnerable in terms of exposed population of all 136 of the world’s million-person port cities3. This is consistent with a figure of 3 million produced by the earliest detailed impact studies available on Lagos made in the early 1990s4, and the range of between 2.3 and 4 million produced by the latest available review commissioned by the United Nations Industrial Development Organisation (UNIDO) in 20125. Thus the challenge is really how to accommodate these future millions as quickly as possible in formal developments and on dry land, both of which are in undersupply in Lagos state. As the Portuguese etymology of the name implies, Lagos state is characterised by a chain of lagoons and tidal creeks, each encircled by wide belts of swamps and lowlands. The tributaries that feed into them carve muddy gullies through the shallow slopes that rise to the north. Each year, a few more feet of foredune along the Lekki peninsula wash away into the sea, exacerbated by colonial-era groynes that prevent replacement sediment from being deposited by longshore drift. 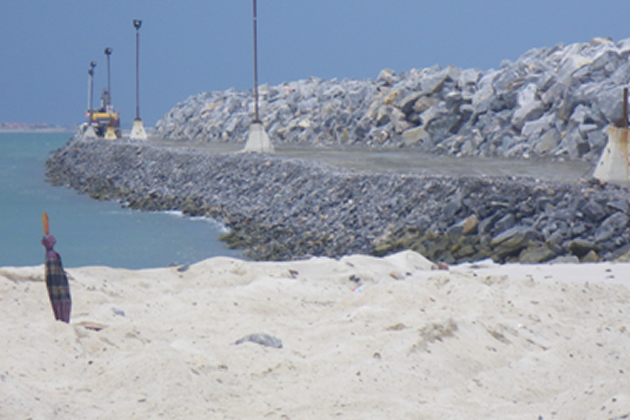 Beach sands need long, smooth, linear coastlines to allow waves to replace as much sand as they dislodge as they roll from west to east along the Bight of Benin; perpendicular projections such as the groynes and western sea wall of Eko Atlantic interrupt the process of sand deposition for several kilometres to their east each time, causing erosion in Lekki to continue unabated. With nowhere else to expand into, it is exactly these swamps and lowlands that Lagos intends to fill with new urban development. The total projected population for the coastal areas of Badagry (to the west), Apapa (to the south) and Lekki (to the east) under their respective city model plans is around 11 million people by 2032, of which the above studies make clear that about one-third will be placed directly in harm’s way. 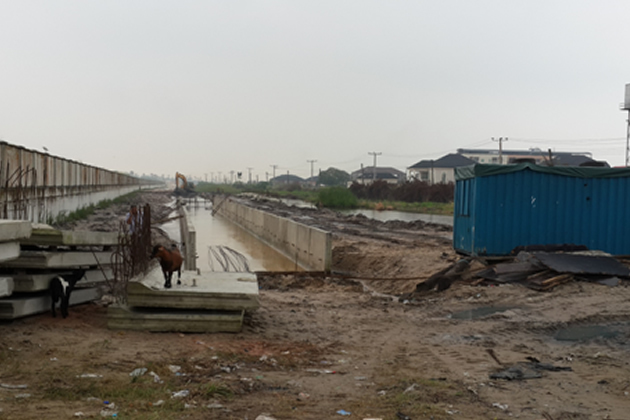 How can Lagos countenance placing so many millions of its future residents on vulnerable land? According to the city model plans, the key will be the clearing and upgrading of the city’s existing storm water channels, and their expansion into an extensive hierarchy of swales, drains, canals and basins to channel surface runoff throughout the new development areas before draining naturally into the lagoons. Well, this may address the increasing volumes of rainwater brought by the more intensive storms expected across the state, but it does not address the other, monstrous impacts climate change is expected to bring to Lagos: rising sea levels, tidal surges, water logging of soils, subsidence and erosion, salination of the water table, and the health problems and diseases that will spread in the resulting saturated environment. There are really only two ways to prevent rising waters from flooding and infiltrating the land occupied by these millions of future Lagosians. The first is to establish a much more technologically advanced array of barriers ringing any low-lying areas marked for development: a high sea wall along the Badagry and Lekki coastlines; barriers across the mouth of the Lagos Lagoon and at key thresholds along its western and eastern reaches; an assortment of dikes and berms running overland between these points, and relief channels to reduce pressure outside this encirclement. If the Lagos state government really wants to house 11 million people in these low-lying areas, then we are talking about something akin to the MOSE (or “Moses”) Project under construction across the Venetian Lagoon in Italy, a lagoon of similar scale to the Lagos Lagoon system, and which has already cost the Italian government $7 billion. This would be on top of the several billion dollars’ worth of drainage works the Lagos state government already hopes to carry out under its current city model plans. The alternative would be to choose not to locate the great majority of these 11 million or more Lagosians in these low-lying areas, though this cannot be achieved simply by outlawing development in certain parts. Sufficient land must be found elsewhere. Fortunately, this is one resource that the Lagos metropolitan area has in abundance if it looks to the north. Rather than attempt to squeeze so many of its growing millions onto its narrow, water-logged coastline, the Lagos metropolitan area could grow much more comfortably and securely by shifting the bulk of that growth into the outlying suburbs to the north and northeast, and developing other suburban centres beyond them. It could go even further by adopting a truly regional approach to planning, establishing a constellation of major satellite cities by expanding the existing towns of Abeokuta, Sagamu and Ijebu Ode into important poles of economic growth and residential opportunity within the region. This would create a polycentric metropolis similar to Delhi in India with its satellites Gurgaon, Noida, Faridabad and Ghaziabad, or São Paulo with its Santos, Campinas and São Jose dos Campos in Brazil. Turning the north of the Lagos metropolitan region into attractive centres of growth for businesses and residents alike so that they absorb the lion’s share of the region’s future millions would arguably be a better use of its funds than fighting a losing battle against climate change in the flood-prone west, south and east. The Lagos metropolitan area already draws much of its food and water supply from these northern areas, and will have to continue to invest in developing these resources in these areas, come what may. To invest in their urban development would be a natural extension of these realities. The problem is that all of this wonderful higher ground is not actually in Lagos state; it is in its northern neighbour, Ogun state. Yet this artificial distinction should not prevent the people of the Lagos metropolitan area from considering this obvious and rather promising opportunity. This metropolitan area has spilled over into several local government areas of Ogun state for many years and will continue to do so. It will be increasingly a matter of happenstance whether a new member of this metropolis finds their home in this state or the other. It thus behoves this metropolis to think about this territory holistically, especially since this opens up a whole world of solutions to the problem of climate change. And one of the most effective may be, as has often been whispered by authorities, demanded by residents of border suburbs, and recommended by administrative reformers, to merge these two states into one coherent entity. There are two versions of this idea. One is to merge Lagos and Ogun into a new single state. While this version meets with a lot of knee-jerk resistance, it is worth restating its merits. If the border between these two states evaporated tomorrow, and a single administration found itself in command of the whole area, many of the constraints facing the planning of the metropolitan area would themselves disappear. This enlarged state’s planners would have immediate powers to encourage development to the north of the Lagos metropolitan area, to relieve pressure on the fragile coastal areas. They would have immediate powers to effectively plan and manage the exploitation of the entire territory’s water and energy resources, without artificial competition from a competing administration. They would have immediate powers to plan a single integrated metropolitan transport system. And they would do so with a single state bureaucracy, at perhaps half the cost of the two state bureaucracies that now operate across this territory. Readers from outside the country may not be aware that the redrafting of state boundaries is a common occurrence in Nigeria; since independence in 1960 the country has come together five times to do just this, evolving from a republic of four regions in 1963 to a federation of 12, 19, 21, 30 and then 36 states (plus the Federal Capital Territory of Abuja) by 1996. Usually, existing states were further subdivided to bring government closer to neglected areas within those states, but areas were also occasionally reassigned from one state to another. The concept of redefining state entities for developmental purposes is a well-established institution within Nigerian governance. The Lagos metropolitan area is now a major force, with the fortunes and communities of Ogun state increasingly intertwined with it. Attempting to plan and manage the two states as separate territories is becoming more and more impossible, and counterproductive, creating a sense of rivalry and competition where coordination and community is required. It creates artificial constraints and forces Lagos state in particular to make terrible decisions as to where its future tens of millions of residents should be forced to live. Internationally, a single state comprising the Lagos metropolitan area and its family of satellite cities would be most directly comparable with the state of São Paulo. Home to 42 million people and with 19 million people in its core metropolitan area, the largest in South America, São Paulo is very much the economic powerhouse on that continent that Lagos wishes to be within Africa. If Lagos and Ogun States are unwilling to consider this great opportunity, then they must be willing to consider the second version of this idea, which is to cooperate in the creation of some other powerful administrative entity that can coordinate action and enforce decisions between them. The previous attempt at this, the Lagos Megacity Development Authority put forward in 2007, fizzled out for many reasons, chief amongst which was bickering over the budgetary contribution to be made by each of the three parties involved, (Lagos, Ogun and the Federal governments). To look abroad again, the salient comparison here is the National Capital Region (NCR) of India, home to 45 million people and with the 22 million people of the Delhi metropolitan area, the largest in South Asia, at its core. The NCR comprises the National Capital Territory along with portions of neighbouring Haryana, Rajasthan and Uttar Pradesh States, the four of them agreeing to delegate regional planning powers to an NCR Planning Board (NCRPB). This institution offers nearly 30 years’ experience in negotiating budgetary arrangements between the four state-level governments and with the Indian central government, which the three governments of the Lagos metropolitan area could learn from. These lessons include the possibility of allowing any future Lagos Megacity Development Authority to raise its own revenue by levying taxes and issuing bonds and loans, just as Lagos State does now. Whichever means are explored, a climate-resilient Lagos metropolitan area will not come about by packing several million new residents along a fragile coastline, and spending billions of dollars to hold back the sea. The cheapest and most effective solutions will only come into view by adopting a regional planning approach in which all levels of authority responsible for the Lagos metropolitan area come together to find ways to accommodate these new millions in safe areas as fast as possible, before they have no alternative but to settle themselves in harm’s way.